Well finally finished my electronic enigma at the weekend. Only a couple years later from buying it at Bletchley park, and it worked first time! In the photo the bottom part with all the wires is the Steckerbrett board, above that is the keyboard, above that the lamp panel, and at the top are the digital wheels. I never actually realised that the wheels actually go around as you type, so even if you press say the letter A twice, it will be encoded as a different letter each time. 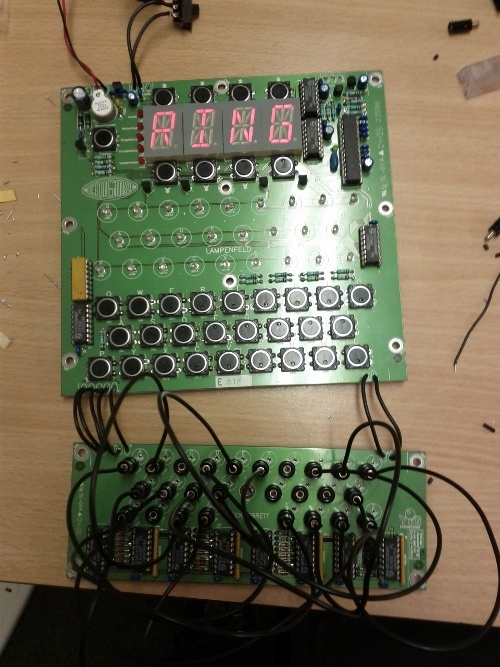 Now all I need to do is wire up the mains adaptor, add the serial port and make a box for it all, and then I can connect it to my computer and send enigma encoded messages across the internet!